It's here (again) gents, DIXIE! This very special blend was made exclusively for The Dirty South Shaver's Meet Up going back about 4 years ago! A most epic meet up in historic, Huntsville, Alabama! You could say it was that very fateful gathering that really got me looking up towards the stars. Dixie was also the first soap in our first soap trilogy! This very soap and splash is the missing link for so many; Dixie, The Wow Signal and Harvest Moon! Credit for this re-release goes to The Dirty South Shavers once more! They really wanted a new Official Dirty South Shaver's Soap & Splash and I was up for the challenge and well...I guess I got it right the first time! I can't take all the credit however, I do remember when I was working on this scent for the meet up way back, it was originally suppose to be a collaboration with Ralph Gabb, of Knock Out Shave fame. Ralph would do the soap and I would do the matching splash. Back then, whenever I did a meet up soap I always wanted it to reflect the area the event was happening in. Not being from the deep south I had only a romantic notion of it, but Ralph was in it. That said, him and I bounced some ideas back and forth and Dixie was born! Sadly, Ralph never got a chance to create the soap for the event for some reason or another...but luckily Soap Commander stepped up to the task, and the rest is history! I should also mention, since the original DIXIE was a limited edition release, a small cult following has grown up around it's legend! 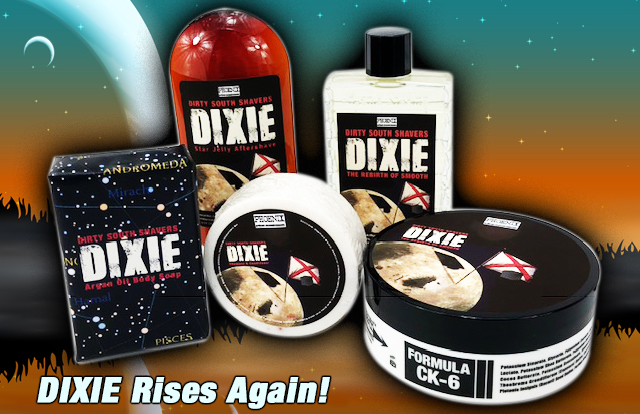 DIXIE is one of my most requested past soaps that people want to see rise again! So to you the patient, and to you the believers and most importantly, to you, The Dirty South Shavers, once again I give you DIXIE...and then some! Special Thanks to the MODs of DSS: Will Coppage, Beau Champion, Ralph Gabb & Ross Beadry! You guys Rock! Same Classic Scent, but I made a few tweaks. I chose to distill some fresh Deer's Tongue Hydrosol to combine with the original Spanish Moss Hydrosol. These two notes combined is my latest favorite scent combo and works so well together, especially when it came to bolstering up this already epic scent! Fights Free Radicals and Boosts Collagen to Keep the Skin Young. Vitamin C Provides Powerful Anti-Inflammatory Properties. Regenerates Cells for A Healthier Complexion. Plus the natural scent of the extract just played so well with the accord, BONUS! When I was asked to do the Aftershave for the DSSMU I was a little flabbergasted...how does one capture the spirit of the South (and then bottle it)? What comes to mind? As an outsider I may have had a bit more insight traveling through with a "clean palette". I immediately noticed the heavy, almost clumsy Spanish Moss and the ever blooming, sweet kudzu. Then the shining star, Magnolia! But...being held in Huntsville, home of Space Camp, I needed a science fiction element, something ozone. So I began blending. What I ended up with was a very mysterious, infectious, syrup of the South and stew of the stars. A Classic, Futuristic, Masculine, Victorian Era Scent...for the intergalactic Southern Gent! Contained within you will find Deer's Tongue and Spanish Moss Hydrosol, Liquid Silk, Hedione, Aloe, Carrot Extract and Camellia Oil! What you get is a highly long lasting aftershave/cologne with a most excellent post shave feel...Out Of This World!